Dig out that crock pot from the bottom cupboard that you never use. Enchilda packet, water, tomato sauce, cream of chicken soup, milk. Whisk until smooth. Add the two chicken breasts. Next add black beans, corn and diced tomatoes. Cook in crock pot for 5 hours. Just before serving, remove the chicken and shred using the tongs of a fork. Put chicken back into the crock pot and stir well. Scoop out a one cup serving size into a bowl. 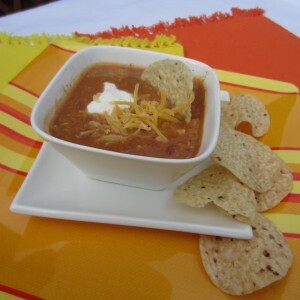 Top with 1 small handful of shredded cheddar cheese and a dollop of fat-free sour cream. Garnish with a tortilla chip and serve. Make (10) 1 cup servings. Each serving with cheddar cheese, sour cream (low or no fat) and 6 crumbled baked tortilla chips is around 260 calories.